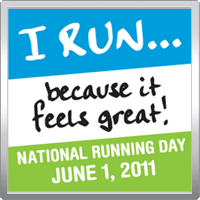 As you may have heard, today is National #RunningDay. DC residents are celebrating all over the city by pounding the pavement or dirt in the near perfect weather exceeding 90 degrees with alerts of all kinds. But whether you are adventurous enough to actually go out and run today or not, it is always good to remind yourself why you run. National Running Day has started a fill in the blank campaign on their website: “I run _____”. As I thought through how I would complete that statement, I came up with a top 5 list. 5) I run so that I can drink more beer. People exercise to stay healthy and to get fit. Running does that for me. If I didn’t run, there is no way I’d be able to burn off all those weekend calories from the bottle. I currently feel like I’m in the best shape of my life. 4) I run for community. Something unexpected came from that random first marathon registration. I became a part of a great DC running community full of local 5kers, 10kers, marathoners, and trail runners. I always look forward to meeting people at the starting line and seeing a familiar face or two. 3) I run because I actually enjoy doing it – most of the time. Sure I hate running in this heat, and I hate running in the bitter cold. But I love running at sunset, I love running through the trees of Rock Creek, and I love the feeling you get after a great workout. Sometimes I might want to cry from pain, but most of the time you’ll see my jogging by with a smile on my face, because I’m actually having fun. 2) I run because I’m a runner. One thing I’ve learned over the past few years is that anyone can be a runner. It’s so easy to get into the routine, and not want to break it. If I go more than a day or two without lacing up the Mizunos , I find myself itching to move the legs, burn some energy, and sweat a little. I’ve become a runner, and I like it. 1) I run for sanity. Because if I didn’t have all those hours, by myself, processing all the good, bad, and the ugly, I’d go crazy. The time spent on a quiet trail, or the mindless miles thrown down on the sidewalks of Northwest DC have helped me realize who and what I love, process and move on from what I might hate, and become the person I am today. “because…I’ve always run.” It’s physiologically addicting…. “because I would feel like sh*t if I didn’t run….” Though, I also run so that I can drink more beer…. Btw, I should mention that Chicago is a runner’s paradise! My daily commute home will be a 3 (+extra tacked on depending on the day) mile run along Lake Michigan, full of other runners…mostly modelesque folks…. I’m by far the fattest runner on the trail. haha, sounds great man! I wish I had a lake to run around. Sounds like you found a good spot in Chicago. 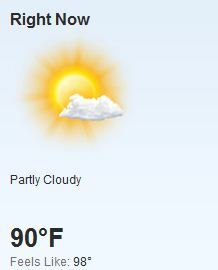 I could use a mix-up on my commute home, especially with this summer heat!